Well would you believe this is the 100th post on Gluten Free by the Sea?! Hard to believe really that the blog has come so far from such small beginnings. I must apologise that things have been a little quiet lately, I’m facing impending redundancy after 16 years in my current job so real life has had to be given some priority unfortunately. So if anyone knows of any IT jobs going in Plymouth then please give me a shout! Anyway, back to gluten free talk. It seems like an age since I’ve added a new restaurant review, so it’s good to be able to add one for another local independent that is taking gluten free seriously. I first heard from Chris and Tracy Holland back in March. 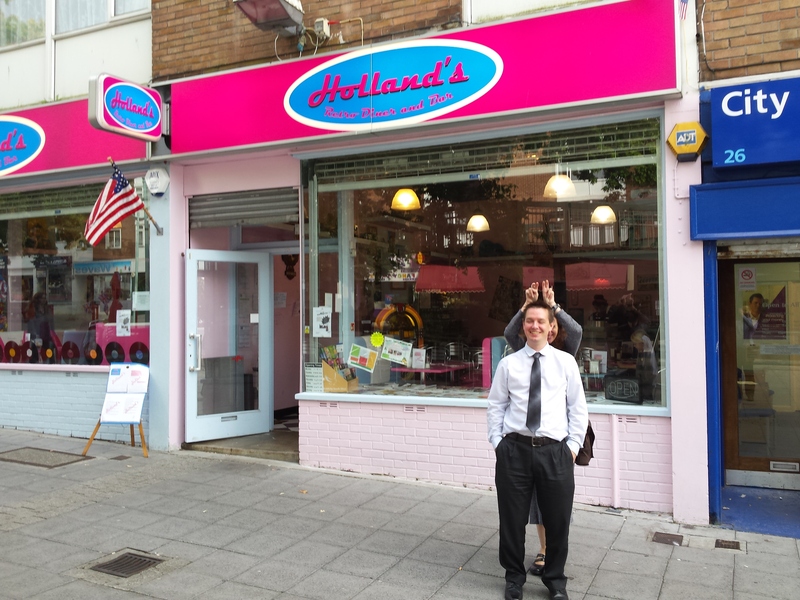 They informed me they were working hard to open a new retro American diner called Holland’s Diner, that would be based in Frankfurt Gate, Plymouth. The good news was that Tracy and Chris were planning on offering extensive gluten free options. Yes we are aware of the cross contamination issues. We have coeliacs in the family – in fact my mum is coeliac and my son has a gluten intolerance. I am a qualified nurse and nursed many coeliacs during over twenty years in the profession. Chris and I have spent many hours trying to plan the kitchen area to ensure there is no risk of cross contamination. 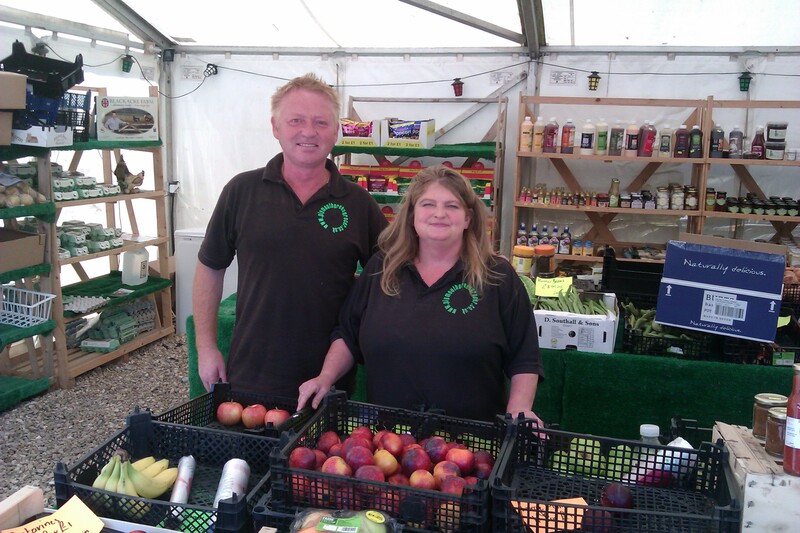 We have separate prep areas, storage areas and cooking equipment specifically for the GF foods. We also plan to colour code everything to help staff, I have also prepared a simple teaching booklet to give all our staff a greater understanding of the disease and the implications of cross contamination. The reason we are so keen to provide the GF options comes from our own experiences of the limited options for coeliacs and the difficulty in families being able to eat together without worry. We will be offering our coeliac customers the chance to view the kitchen procedures so they can see for themselves that we know what we are doing! 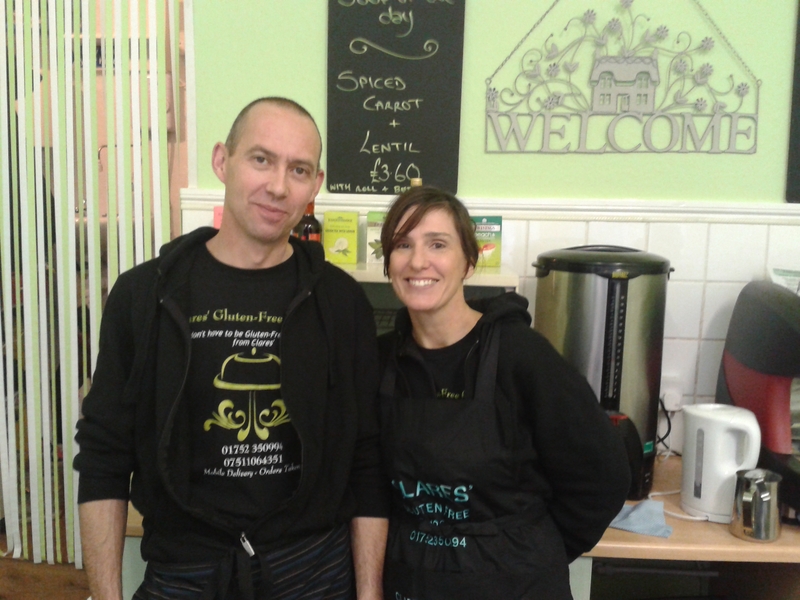 In May Tracy and Chris took a table at the Coeliac UK Plymouth Group AGM and came along to show those present their proposed gluten free menu, and talked to people about their upcoming venture. They also brought along their Wurlitzer jukebox to help give a feel of the retro look that would be the theme of the diner. After seeing all the photos of the hard work that was going into getting the diner ready on their Facebook page, it was good to see the hard work rewarded with a grand opening in June. I’m not quite sure how it has taken me so long to get there, but the universe has seemed to get in the way on a few previous attempts to get my hands on a big gluten free burger. However, this week a colleague was down from Exeter and we were looking for somewhere to have a late lunch. At last the perfect opportunity! So on Thursday, gluten eating colleagues Rich, Chris and Jill joined me for a meal at the diner. 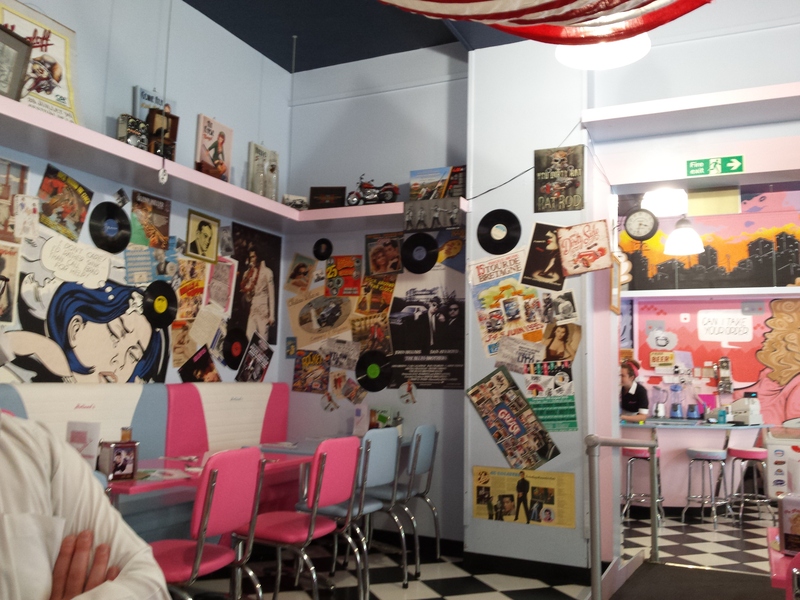 Tracy and Chris have certainly achieved the desired retro theme, and the walls are covered with memorabilia. The padded diner booths also looked great. There’s also an outside eating area too. I’d already checked the menu on their website in advance, and it was good to see the gluten free options marked. The site also contains a page detailing the diner’s gluten free procedures. The menus in the restaurant are also clear on the gluten free options, and in most cases GF options are available unless otherwise stated. There are also some GF dessert options available, supplied by the previously reviewed Ladybird Bakery. They are supplying apple pie, cherry pie and pancakes. It’s good to see that local suppliers are being used, with all meat sourecd from local butchers. First things first though, having just finished interviewing for our own jobs we were keen for a stiff drink! I was extremely intrigued to see a blueberry cider on the menu so it was a no brainer to give this a try, as did everyone apart from poor old Rich who had to drive. Thumbs up all round on this one. There’s also a strawberry cider on the menu which no doubt I’ll try in future. 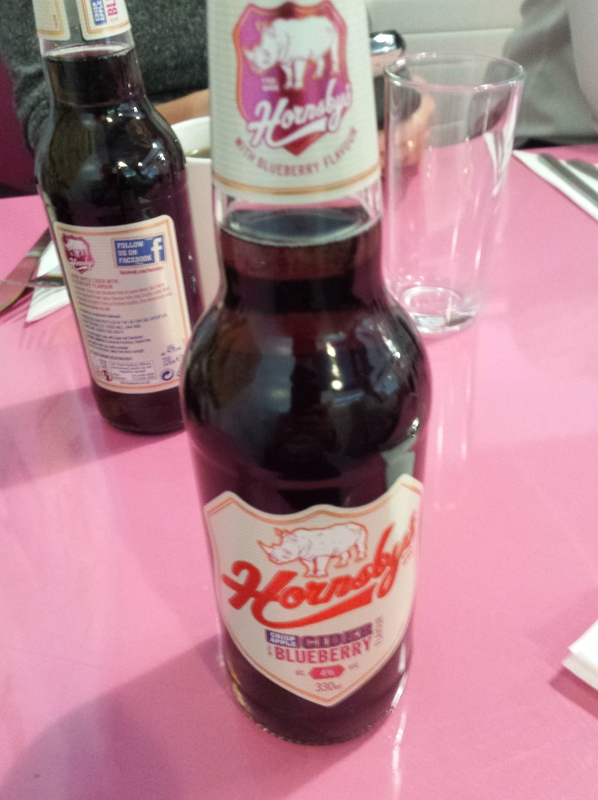 The cider is made by a company called Hornsby’s Cider whose Anglo American roots seem to be a good fit with the diner. 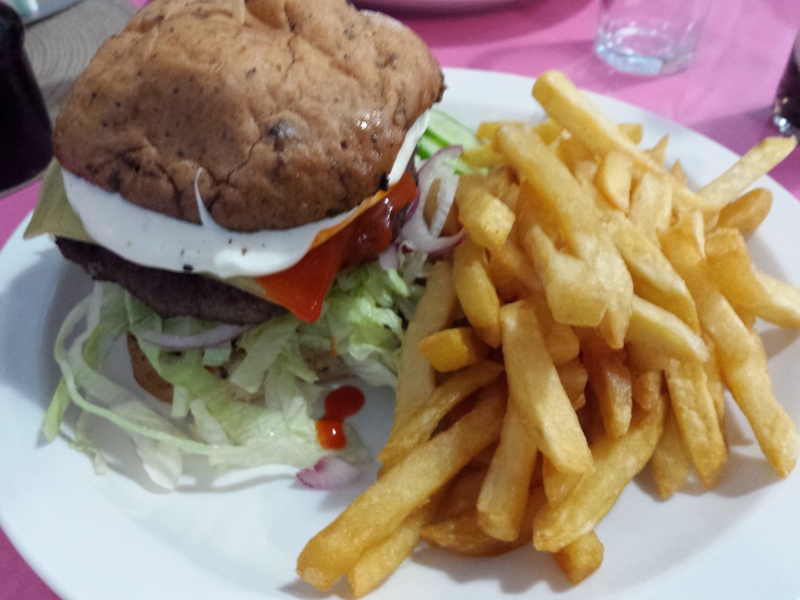 As for the food, I wasn’t going to pass up the chance of a gluten free burger in a bun with chips any time soon. There’s a good selection of burgers and from a gluten free stand point there’s barely anything to miss out on. I opted for the Chrysler, a half pound burger, salad, mayonnaise, Monterey jack cheese, topped with Holland’s chilli sauce. The quality of the burger itself was excellent, really satisfyingly meaty (sorry Abby! ), and the gluten free bun was extremely good too. The chilli sauce gave great flavour, but due to the amount of sauce/mayo and salad I had to commit the cardinal sin and knife and fork it. Oh the shame! Overall the Chrysler was great and the chips were good too so I really enjoyed the meal. The only downside was I was too stuffed to try any of the puds. I’m pleased to report I suffered no ill effects from the meal. It’s great to have another safe option to eat out gluten free in Plymouth, especially from an independent. I should also say that our waitress gave us great service too and I’m sure this will not be my last visit. If you’re a music fan also keep an eye out for their live music events. 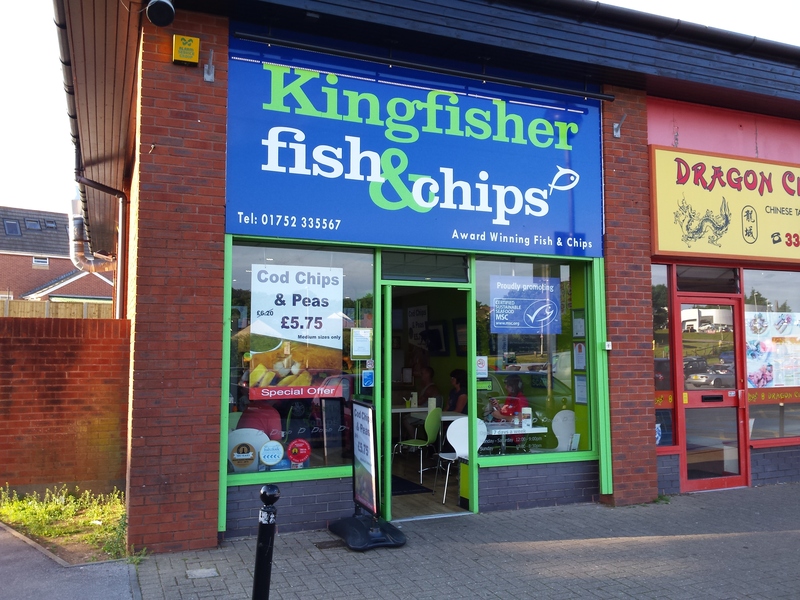 Thanks to a tip off from Coeliac UK Plymouth group member Matt Gifford, I recently discovered that Kingfisher Fish & Chips in Chaddlewood Shopping Centre are now serving gluten free fish and chips every Monday. With the uncertainty surrounding the sale of Eggbuckland Fish and Chip shop at the time this was very welcome news indeed. Thankfully the Eggbuckland sale has now been completed and the new owners have confirmed that gluten free nights will continue on the first Monday of every month. There are a few other chip shops in Plymouth serving gluten free on various days or indeed daily in some cases: The Chip Stop in Stoke, Honicknowle Fish and Chip Shop, Francine’s in North Prospect and I believe Thank Cod it’s Fryday in Pennycross still serve gluten free too. The Rock Fish restaurant on the Barbican are also serving gluten free. I am not sure of the cross contamination controls at any of these restaurants though, so please do you own research if you are going to try them. Please feel free to comment below if you have tried any of these or indeed own or work at one of them. I’ve always liked Eggbuckland as their gluten free day is totally GF, so no need to worry about potential cross contamination. However, with the sale process going through there hasn’t been a gluten free night there for a couple of months (they are back 1st July! ), and after seeing a few tweets about Kingfisher after the initial heads up from Matt I decided to investigate a little further. I noticed that Kingfisher have started to push gluten free quite hard via Twitter now, and I was impressed with the gluten free information on their website. Kingfisher use a separate fryer which is cleaned prior to being used for GF and loaded with clean oil. They also state “all other equipment is used solely for the purpose of gluten free to prevent cross contamination”. Gluten free is served all day on Monday’s with no need for advance warning and is cooked fresh to order. Batter is made on-site using their regular recipe with gluten free flour. GF vinegar is also stocked, and no extra is charged for gluten free orders. 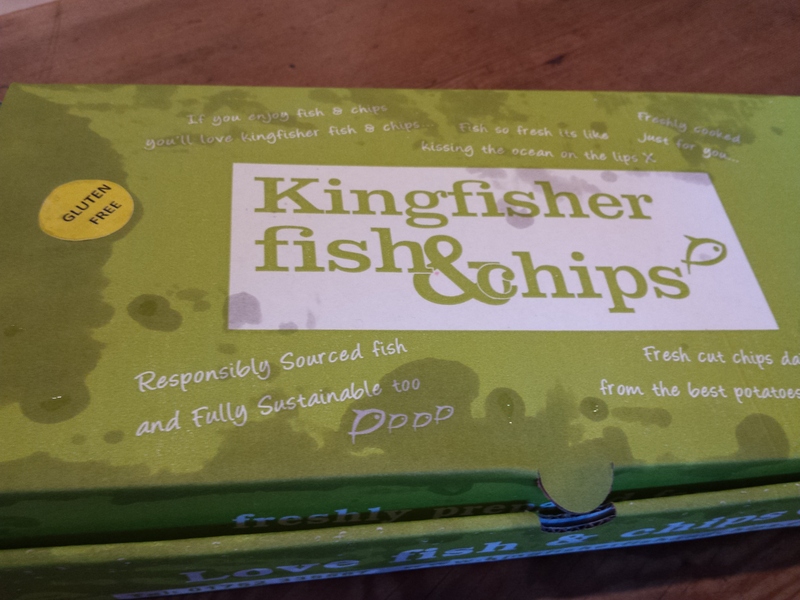 Having a wife who works in environmental marine policy I was also very impressed that Kingfisher are very proud of the fact all of the fish is caught sustainably, with the cod, haddock and hake being MSC (Marine Stewardship Council) certified. 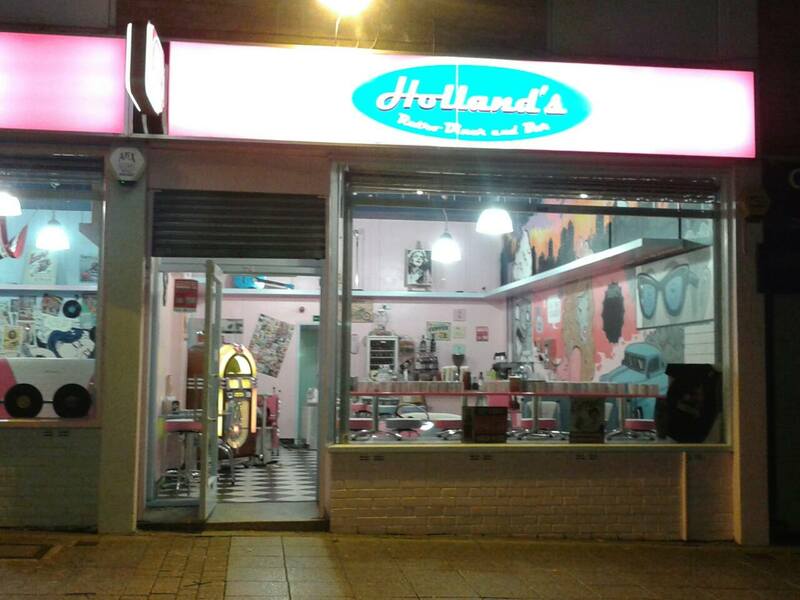 They were also finalists in the 2014 National Fish & Chip Awards. So after reading all this I was sold. I’d been tweeting owner Craig for a few weeks and let him know I was coming as I was eager to have a chat with him when I got there. Ironically living by the sea I don’t eat fish so my choice from the gluten free menu was a little limited. I’d previously mentioned to Craig on Twitter that it would be great to see a battered sausage on the menu, which he was very keen to look into. The power of Twitter worked it’s magic and before we knew it Craig was in contact with a local company who are dropping off some sample gluten free sausages soon, so which this space. It would have been good to try the batter, but I often went for chicken and chips in my pre-coeliac days so this was an easy choice. While my food was being freshly cooked I was able to have a good chat with Craig. They have been serving gluten free since January after several requests from customers and friends. They have been working hard to make sure they have the correct procedures in place and increased menu options and are now happy that they can do things properly which is why they’ve started pushing this recently. Craig actually thinks the gluten free batter gives a crisper result than the normal batter which is a good sign. It was good to hear Craig’s enthusiasm for gluten free and his desire to make sure things are done properly. Kingfisher obviously have some happy customers, and one punter that has been going there for 10 years witnessed our conversation and came up to tell us how great everything was! Onto the food. 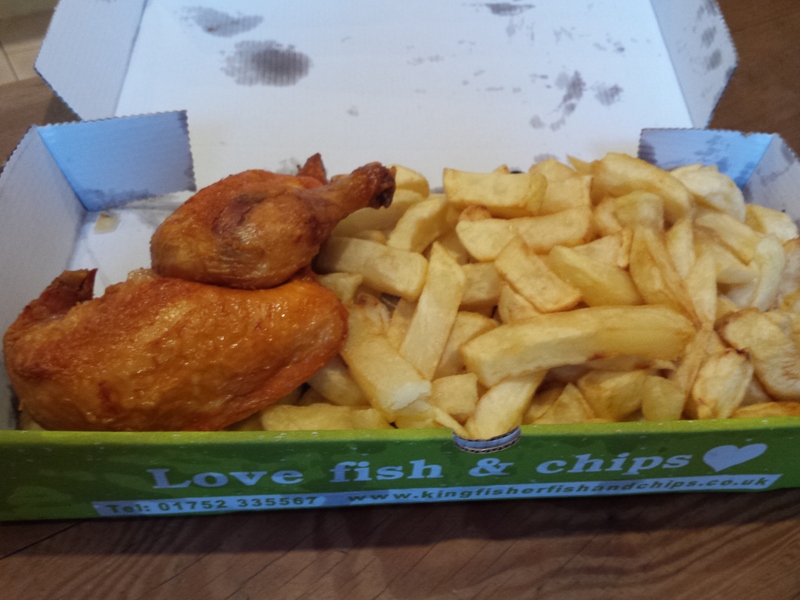 No old school newspaper here, the food is served in a swanky Kingfisher box, and it was reassuring to see a gluten free sticker on top of mine as there were gluten filled fish and chips being cooked in other areas of the shop. It was obvious that everything had been cooked freshly and it was still pipping hot by the time I had driven home. The portion size was very large and at £5.75 for chicken and a large portion of chips I had no complaints about the price. 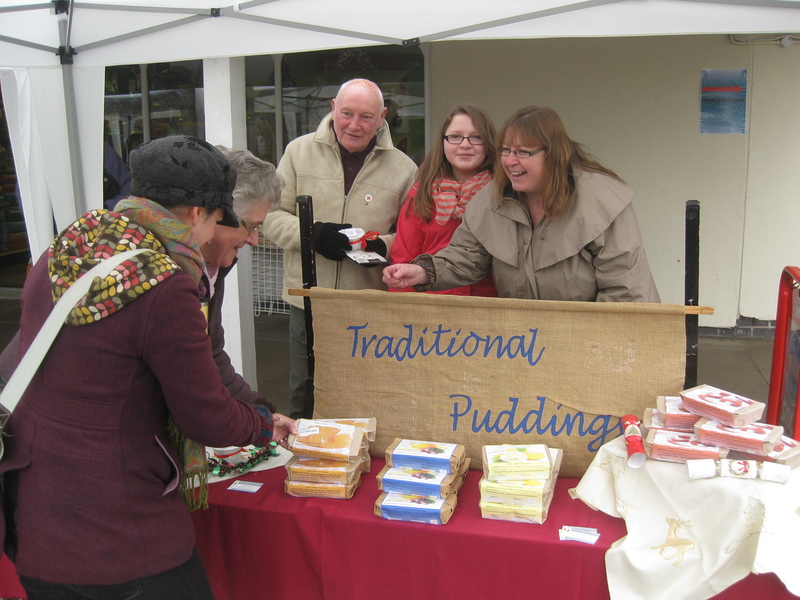 There was apparently lots of other gluten free customers tucking in yesterday too which is good to hear. The quality of the food was excellent and I’ll definitely be back again for more. A friend whose family also tried Kingfisher for the first time yesterday told me on Facebook “We all agreed that it is the best gf fish and chips we have had“. The only downside for me was that there was no gluten free curry sauce to dunk my chips in but I’m happy to report that Craig is going to look into this as well as the battered sausages. So even though gluten was being served in the shop at the same time, I’m happy to report that the cross contamination controls in place were good enough and I suffered no ill affects, other than a severe case of over indulgence! You can find Kingfisher at: Chaddlewood Shopping Centre, Glen Road, Plympton, Plymouth, PL7 2XS. For more information see their website, Twitter and Facebook pages.